Originally a small-scale pilot in 4 schools in the UK, the resulting recommendations for a different approach to classroom music and a new way for the teacher to operate in these classes scaled up rapidly, first across the UK supported by The Paul Hamlyn Foundation and subsequently in Australia, Canada and further afield. One of the keys to the success of Musical Futures was that all materials and training for teachers were made available for free. This meant that Musical Futures could be picked up by anyone, anywhere and personalised to work in a wide range of contexts. Informal Learning is an approach to Music learning and teaching. One of the core principles of Musical Futures is to allow students to make choices about what and how they learn (and with whom). It has never been driven by content (other than that which is chosen by the participants themselves) nor is it dependent on resources. That means it isn't a downloadable resource or a scheme of work and so the best way to understand how to use it is to attend a workshop and experience it from the perspective of a learner, then unpick the pedagogy behind the approach and the practicalities of implementing it. Of course schools and teachers have a responsibility to deliver a depth and breadth of musical learning often defined by curriculum requirements, therefore allowing students to choose the music all the time may not be the best way to deliver this. 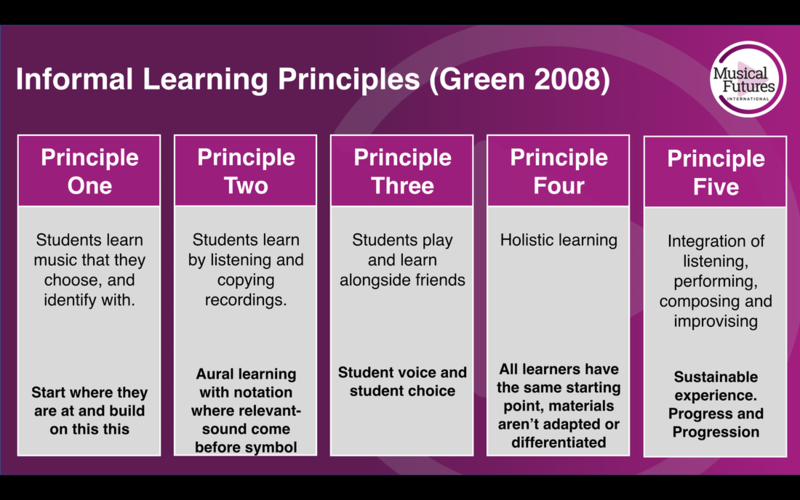 However teachers can apply the core Musical Futures principles to any content and hence it becomes transferrable across different age groups, content and context. ​This video from the original pilot shows how students can then move on to other activities that build on and consolidate learning. ​The Musical Futures 'informal learning' approach starts when students go 'in at the deep end'. Students are asked to work in friendship groups and choose the music, instruments and to select their own chosen pathway to the end point-to play a song as a band. ​Learning is holistic in that materials aren't adapted or differentiated for students, this may happen as part of the process but usually when recognised as a need to progress by the group themselves. Throughout the process, students can be observed performing, listening, improvising and even composing as they work their way through each lesson and students learn to play by listening and copying, notation isn't the first or only way to learn. These core principles grew from observing how the students in the pilot project worked through this and subsequent tasks. In addition, it became apparent that in Musical Futures lessons, the value of the learning journey and not just the outcome becomes an important part of the assessment and supporting process. Of course, these aren't to be taken literally. It can take a bit of practice to get the balance right. If friendship groups aren't working out, get involved and support students to make different choices. It's how you help that matters. The key is in diagnosing what's needed for students to make progress, yet offering help in a way that allows them to demonstrate what they are capable of whether that's musical or in terms of the contribution they make. It's not easy, but when it works the improvement in relationships within the group and the resulting engagement and enthusiasm for music is instantly apparent. In fact this has been backed up in plenty of research and evaluations of Musical Futures which can be found here. Keeping it musical, modelling, playing along, guiding are all good strategies. However, ultimately the teacher is responsible for the learning that takes place in their classroom and normal classroom management strategies, relationships and flexibility that underpins good teaching is just as relevant in Musical Futures lessons. And finally here are 2 videos filmed at Monks Walk School in the UK of students working in this way.